Music blog Middle Class White Noise posts “Meet You at the Bus” and says some very, very nice things! “Dare Dukes, unsurprisingly, comes out of Savannah, Georgia, though his biography seems to throw him all across America at one point or another. ‘Meet You at the Bus’ contains a universality that seems borne out of that travel, as does the simple sentiment of, well, meeting at the bus. Its youthful restlessness is something that virtually everyone has felt at one point or another and its coupled with a ‘let’s steal away together’ romanticism befitting of young, not-quite-so-forward-thinking love. Dare Dukes reminds me most of Loundon Wainwright III (particularly ‘The Swimming Song,’) with his distinct voice and, of course, the banjo-based pop. The song’s only really a touch ornate, with banjos and guitars doubled up for a thick sound and a few horns to lend some flavor.There’s a lot of easy comparisons to make when talking about the sound of the song, from The Avett Brothers to The Mountain Goats to They Might Be Giants. 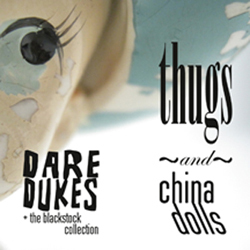 Apt as these comparisons are to the whole of a lot of ‘banjo pop,’ Dare Dukes maintains a distinct sound mostly thanks to his wonderfully punctuating voice.